Concept, design, production and manufacture of custom furniture. 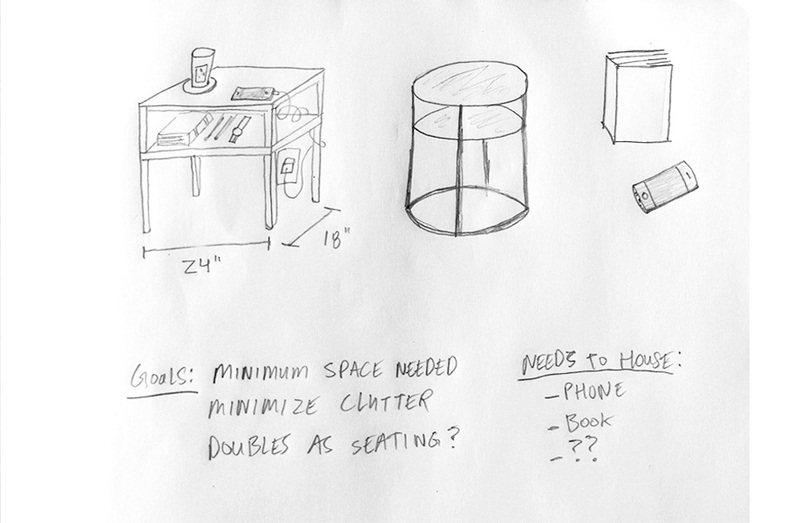 I have had the idea for a while to create a simple bedside table that can double as extra seating when needed. I don't have a lot of space for large furniture (my bed fits in a space just over 8 by 8 feet), and I like the idea of a side table that comfortably holds my pocket's contents and a book, but little else. I've figured out that horizontal surfaces in my living space quickly become magnets for clutter, so the easiest way to keep a space clean and tidy is to minimize any furniture without a specific goal, and to use multipurpose furniture when possible. 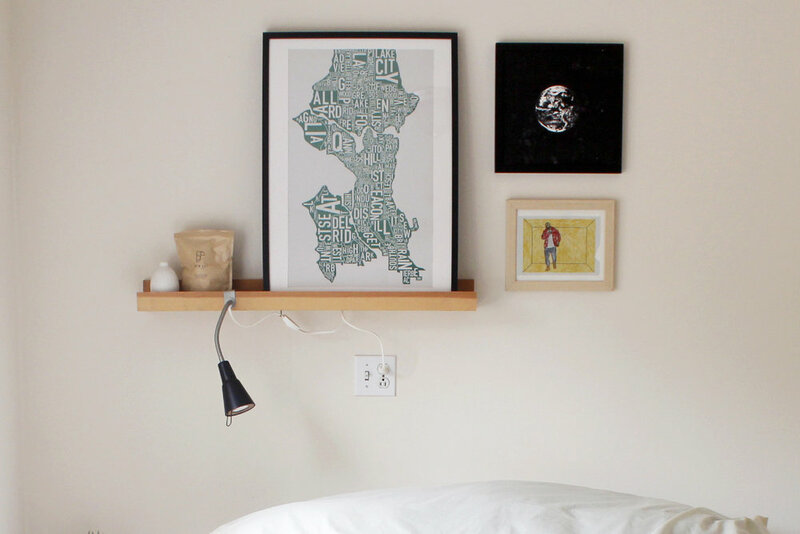 For example, I designed and installed a shelf above my bed that holds artwork, a vase, and has a reading lamp attached. The shelf is a perfect location to stash small items such as hand lotion, earplugs or cough drops; within arm's reach yet out of sight. For this table project, my starting point was drawing inspiration from 3 and 4-legged stools, and the textures and contrast of the leather and wood of the Eames Lounge Chair. I don't normally like exposed plywood, but I find it amusing that one of the most coveted icons of American furniture design is made with the humble material. I played with the idea of fashioning rocket fin legs, but I didn't want to over complicate the design, so I decided on the clean lines of 1 1/4" dowel, a simple, durable material. 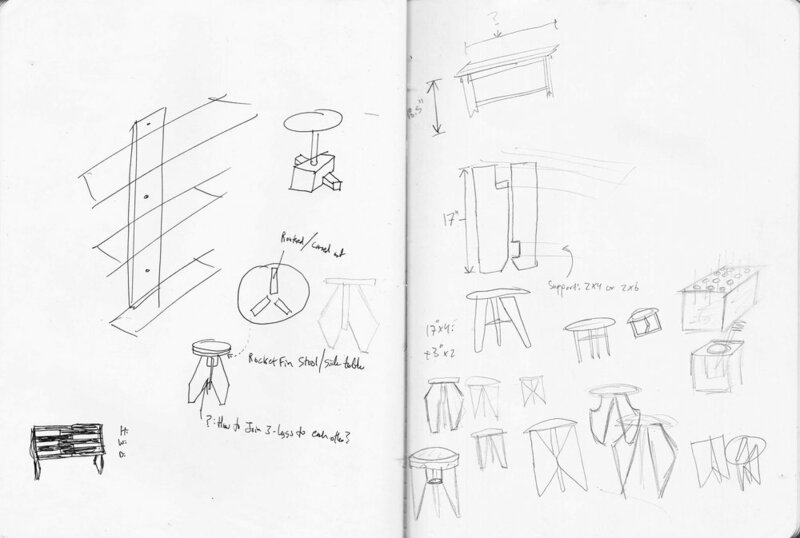 I decided on the stool design because my house doesn't have frequent visitors, but when we do, we quickly run out of seating. My room opens into the backyard, and I love the idea of hosting a s'mores night around the fire pit, and when more company shows up, I can provide additional seating as easily as grabbing a stool from my room. After measuring all of the seating in my house, I landed on 18 inches as the optimal height: tall enough to be used as seating at the table, and hold my phone within reach from bed, but short enough to provide a comfortable stool perch height. I decided early in the process that I wanted to combine materials and include a leather top to the table, partly function: a forgiving surface a phone can be dropped on without fear of damaging either phone or tabletop, and partly aesthetic: the light tan leather color will age with use, eventually darkening to the red-brown hues of my keychain, which is made from the same material. I chose vegetable tanned leather for the top because of its color and aging properties, and built the tabletop with stacked layers of MDF plywood. The table had to be able to comfortably support a fully grown adult, functioning as a stool, so I used 3 layers of 3/4 inch plywood, then drilled holes about 2.5 inches deep for the legs, to give them a firm foundation. Once I had the plywood jigsawed to shape, I glued it up, ground down the edges to a clean circle with a belt sander, and used a drill press and hole saw to precisely bore out the leg holes, at a 10-degree angle. To get the leather top flush with the plywood, I cut it roughly to shape, glued it to the wood, then came back once it was all set, shaving off leather with a razor until the clean edge was achieved. Overall, I'm pleased with the result, the only changes I may add would be a protective finish to the wood, or some oil or beeswax to condition the leather.